* Flexible and adjustable headband is suitable for different people. * Integrating visual auditory system, the simulation more realistic scenarios. * Only can look at the left-right 3D film (Support Android and iOS Smart Phones). * 3D Glasses uses high-grade Sponge, more fit for your facial outline when you wear it. * 3D VR Virtual Reality Glasses, Offers you super 3D Picture Effect and Wonderful Feeling. * Add visor to prevent leaking light,can press the button answer the phone,adjust the volume. * The button of mirror box applies a snap switch and impressed notch design, convenient and firm. the observed pictures are clear and without double images. The lens fluctuate from left to right,and to the position with clear view. Manual measuring, please allow 1 ~ 3 cm error, thanks. [Private 3D Cinema]: You can slightly adjust the position of the spherical resin lens through moving the button on the top of the 3D VR so as to get a better experience. 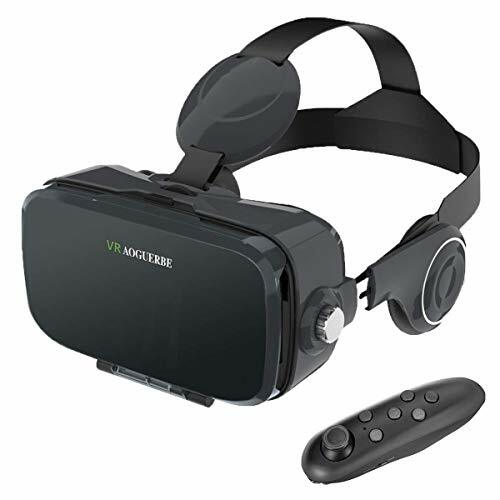 VR Headset makes you enjoy IMAX luxury giant screen theater, panoramic theatre experience FOV up to 120 degree, incredible effect can watch for immersive 3D videos,full views,gaming experience at any time. [Comfortable Design]: Ergonomic head belt design, the adjustable straps can reduce part pressure from bridge of nose, offer more comfortable wearing. The button of mirror box applies a snap switch and impressed notch design, convenient and firm, the focal length setting allowing myopes to enjoy 3D virtual world. [Distinctive Technology]: HD optical resin lenses, without stimulation plastic sheet, lowering down the distortion to the minimum when magnifying the images and providing wider view; You will not feel visual fatigue or dizziness even if you use it for a long time. [Built-in Headphone]: Built-in stretchable earphones, you don't need to put other earphone in. Both sides holes of the VR headset is specially designed for the earphone/ data / charge cable but you had better not charge your phone during using the VR headset. Fits for iPhone, Android phones and Windows phones with screen size 4.0-6.0 inch,(iPhone X /8/8 Plus/7/7 Plus/6s/6 Samsung S8/S7) immersive experience for any ages. Download 3D videos and games sources, enjoying the massive content 3D movies, animation, panorama concert, VR games etc. If you have any questions about this product by YESSHOW, contact us by completing and submitting the form below. If you are looking for a specif part number, please include it with your message.